"One of the first job-hunting books on the market. It is still arguably the best. And it is indisputably the most popular." "What Color Is Your Parachute? is about job-hunting and career changing, but it's also about figuring out who you are as a person and what you want out of life." 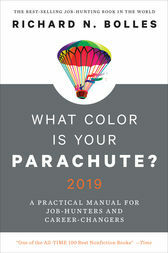 "Parachute is still a top seller and it remains the go-to guide for everyone from midlife-crisis boomers looking to change their careers to college students looking to start one." "It's basically the bible of career advice." "Mr. Bolles continues to enrich and update it, expanding on concepts both universal and technical."